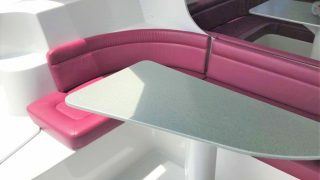 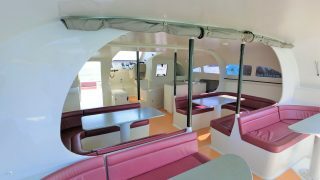 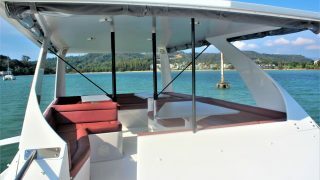 For sale a brand new Stealth 47 Day Charter Power Catamaran. 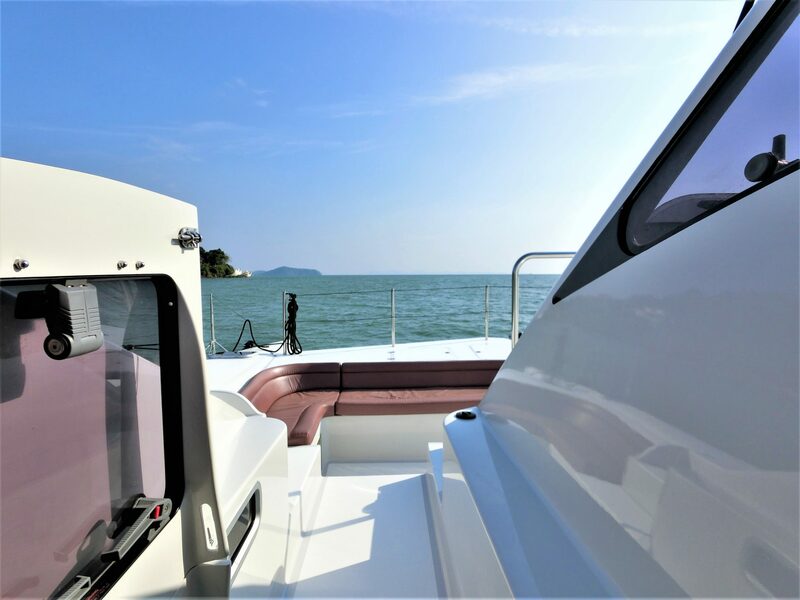 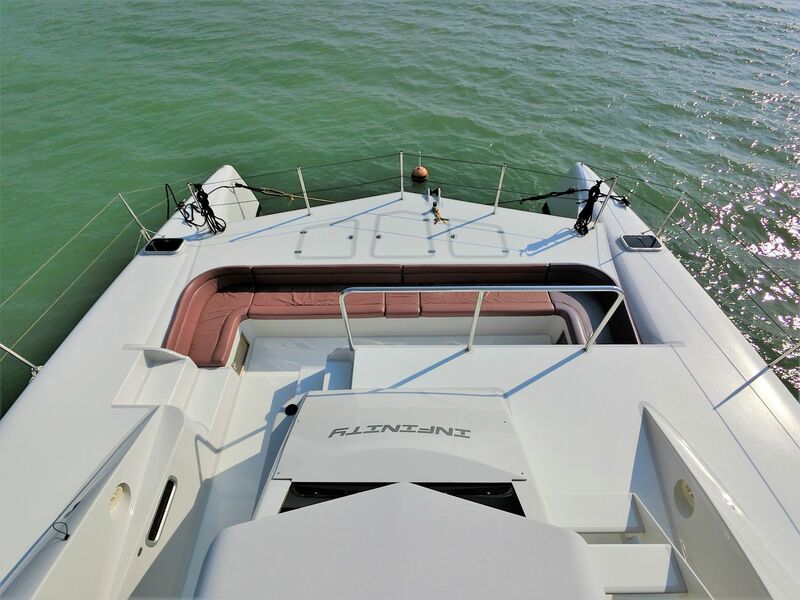 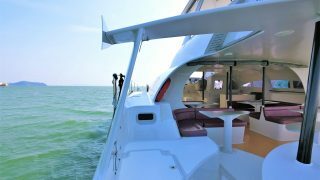 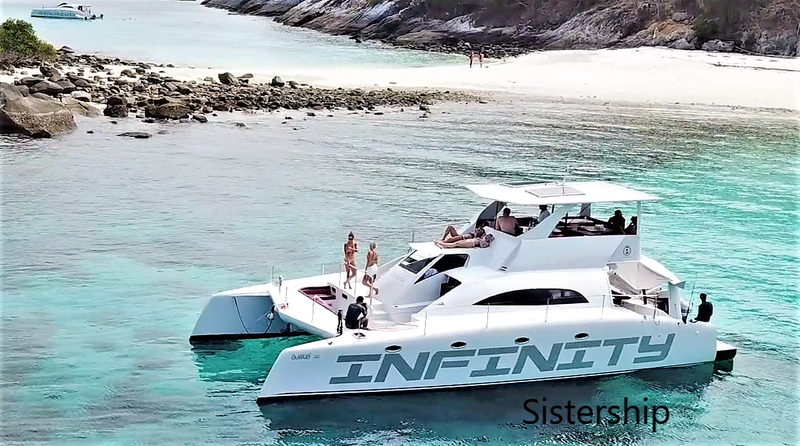 The 3rd build in this efficient and excellent power cat line she is a distillation of the best points of the previous two builds; the hugely successful Rendezvous and the larger flybridge Infinity. 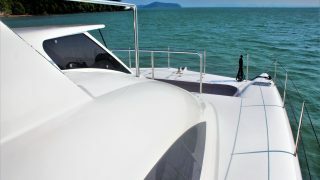 This 3rd in the line promises to surpass both cats record return on investment for any Day Charter market. 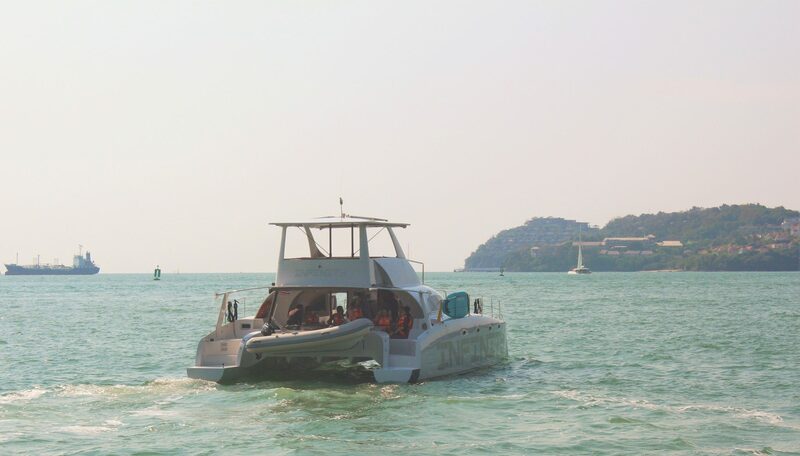 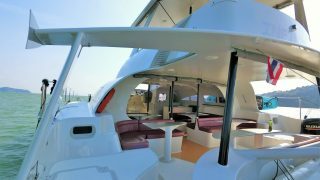 Looking like a mini superyacht, the team at Asia Catamarans have again come up with a winner. Designed to transport a bus load of tourists i.e. 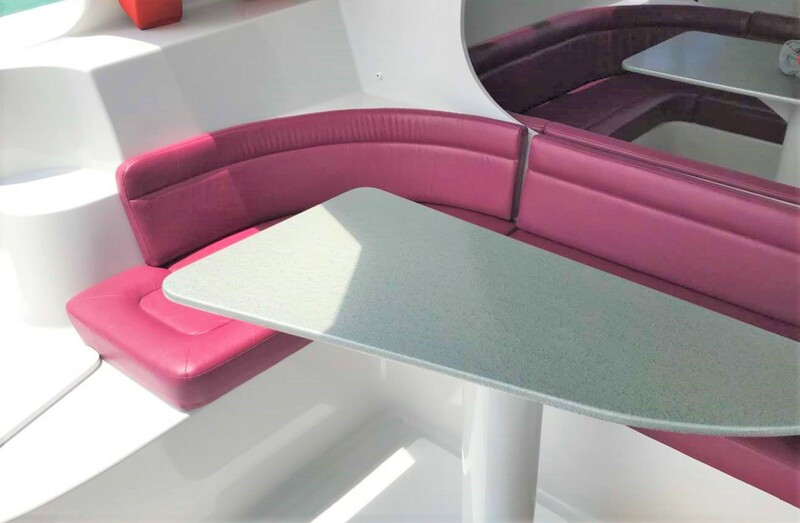 35 including crew, there is undercover seating for all – a very important part of the local charter operator rules. 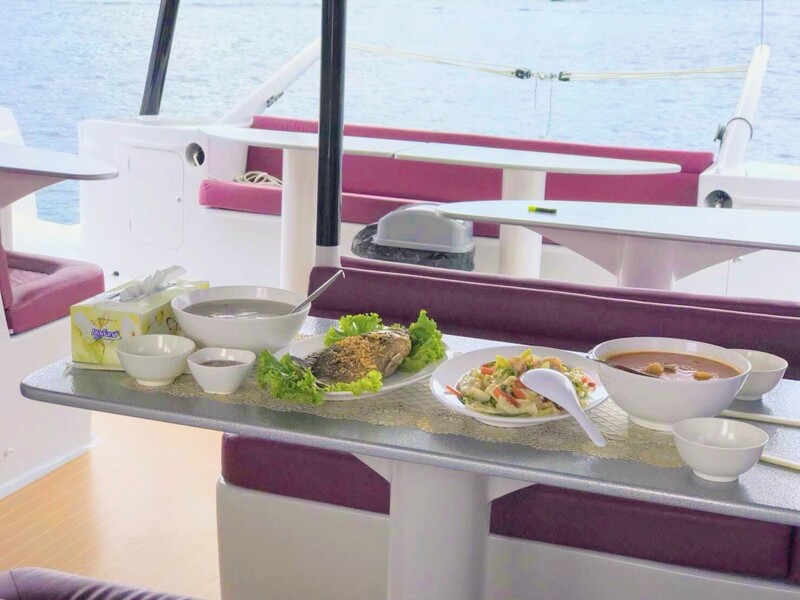 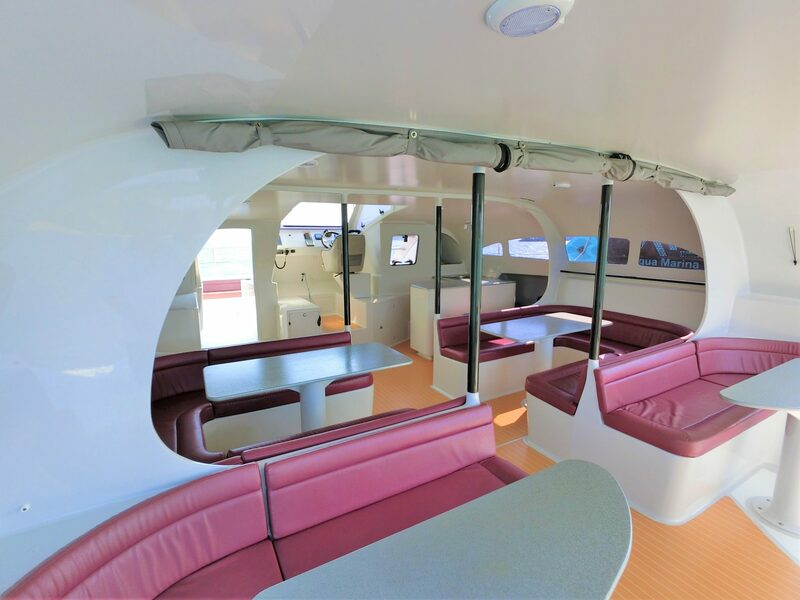 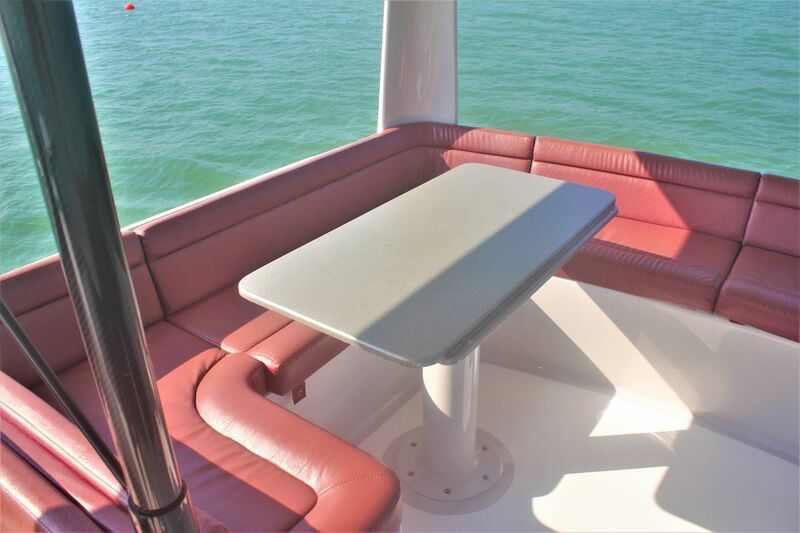 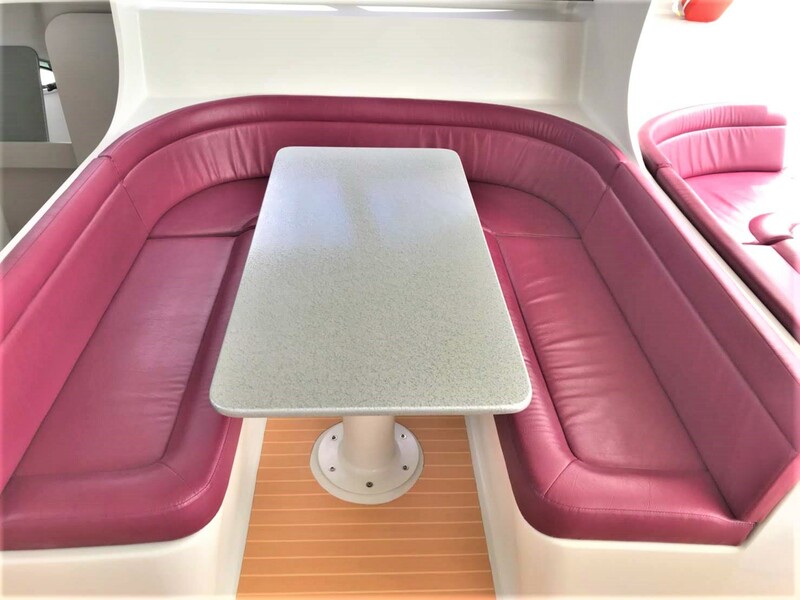 Further benefits of the design mean operators can create lavish meals from an in-hull galley for their guests on day trips or sunset cruises. 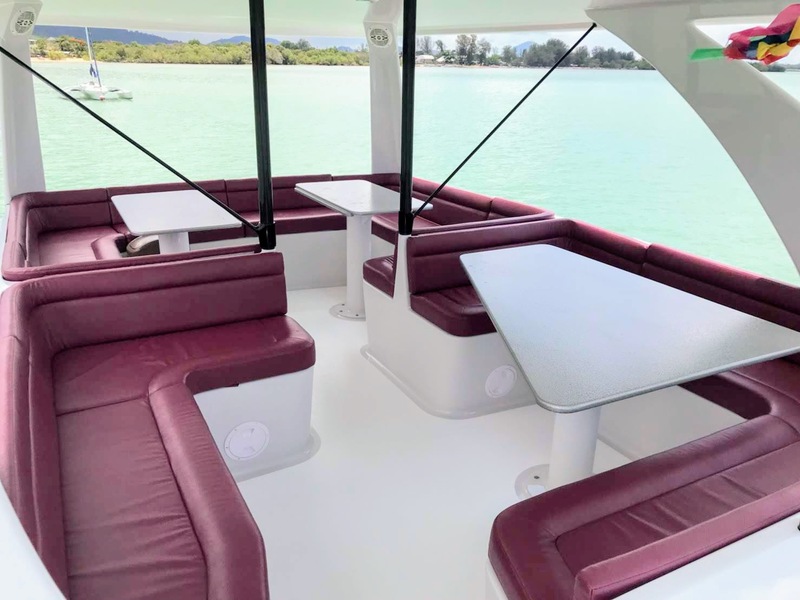 Comfortable seating in three distinct parts of the boat mean guests can circulate from the airy bow seating, to the 360 degree view flybridge, to a more conventional spacious deck saloon. 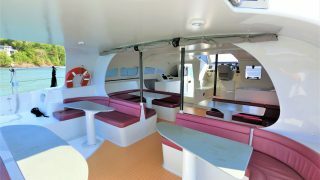 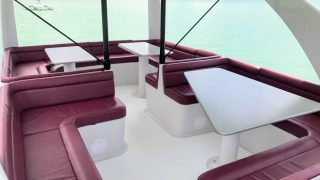 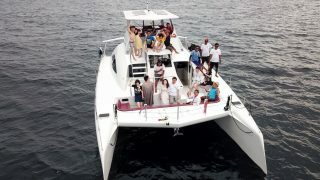 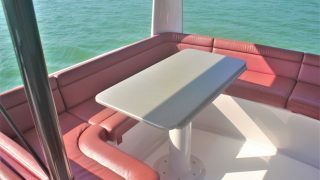 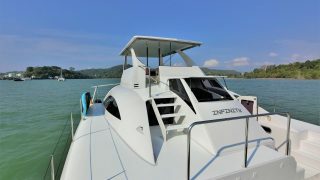 Easy stern access from the dock or into the water for diving or snorkeling groups, enhancing your clients experience. 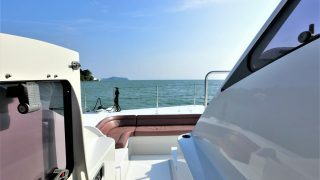 Powered by 2 x 140hp outboards she is economy personified, yet cruises along at 17 knots, with a 22 knot top out. 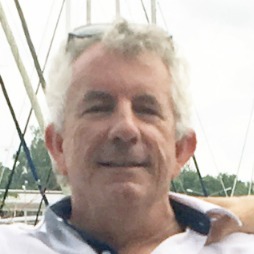 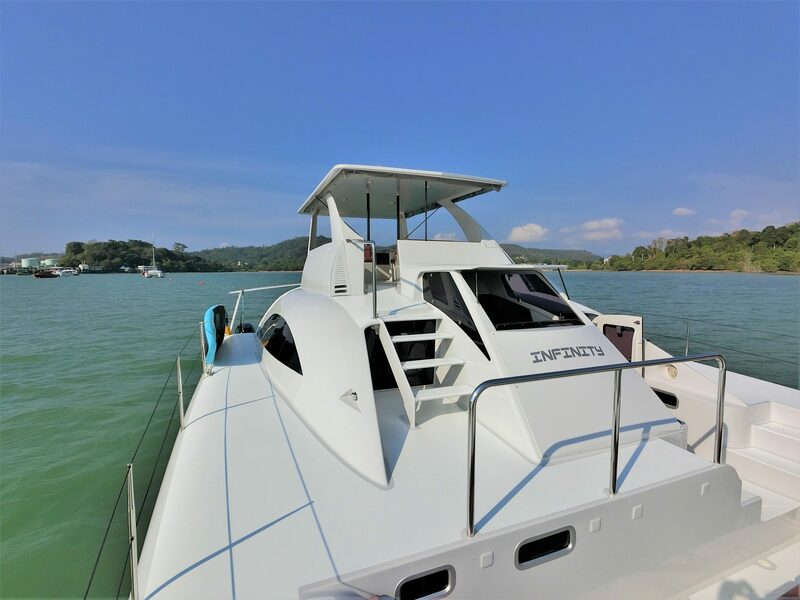 The advanced design means these motors can be fully serviced without removing them from the catamaran, translating to less downtime and more uptime for income generation. 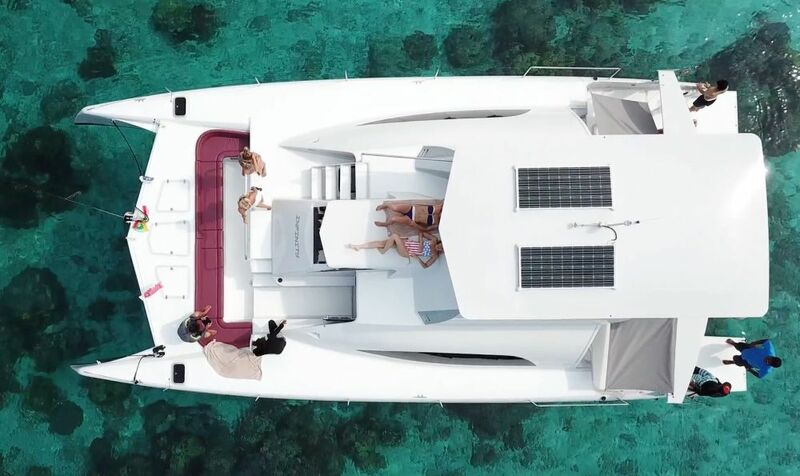 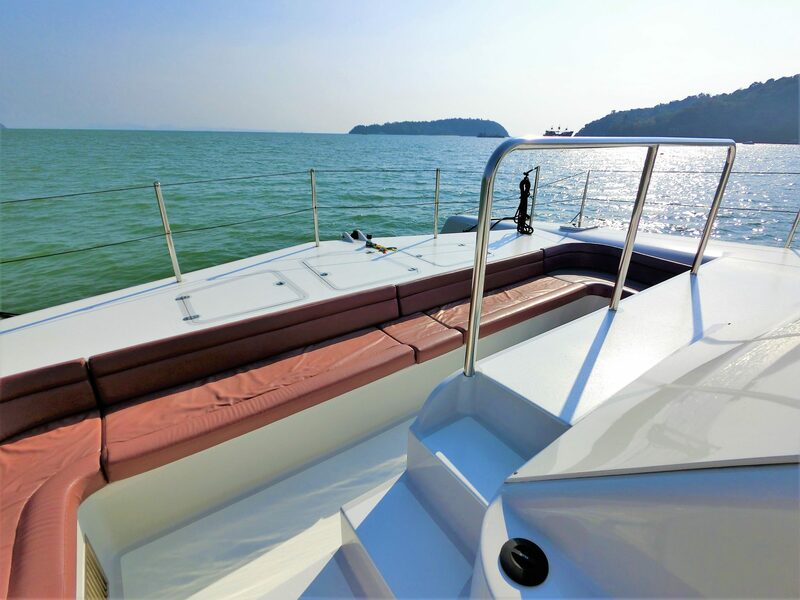 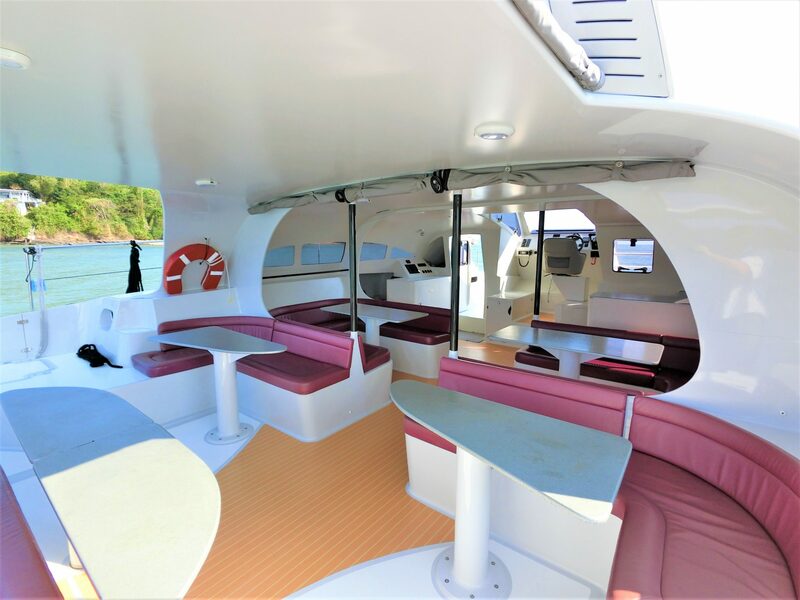 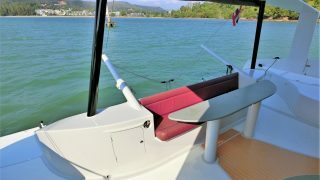 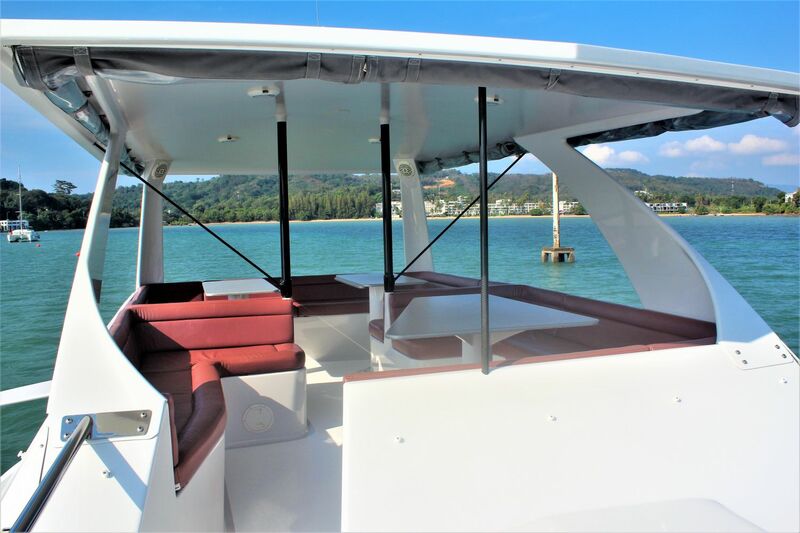 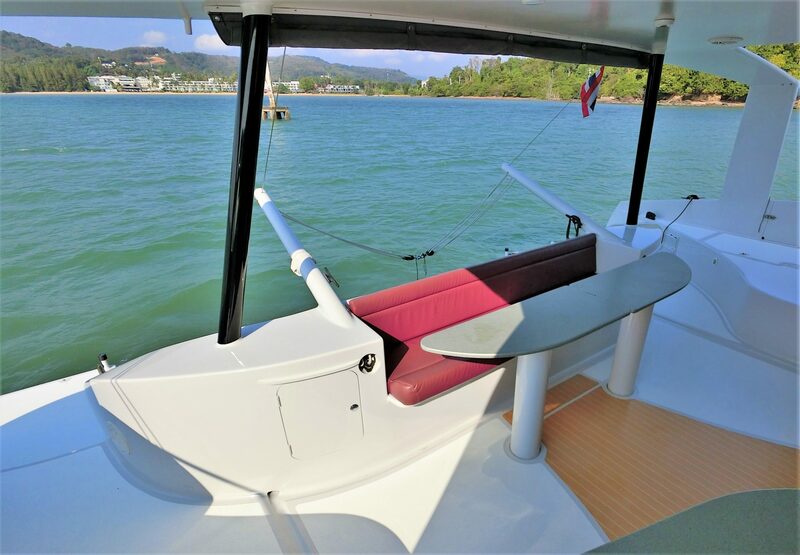 Built with foam epoxy composite with carbon in the right places these cats feature an open plan design with plenty of openings to make the most of tropical sailing. 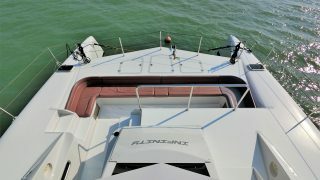 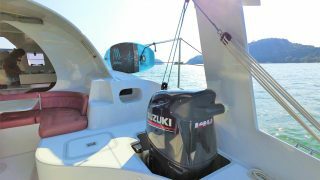 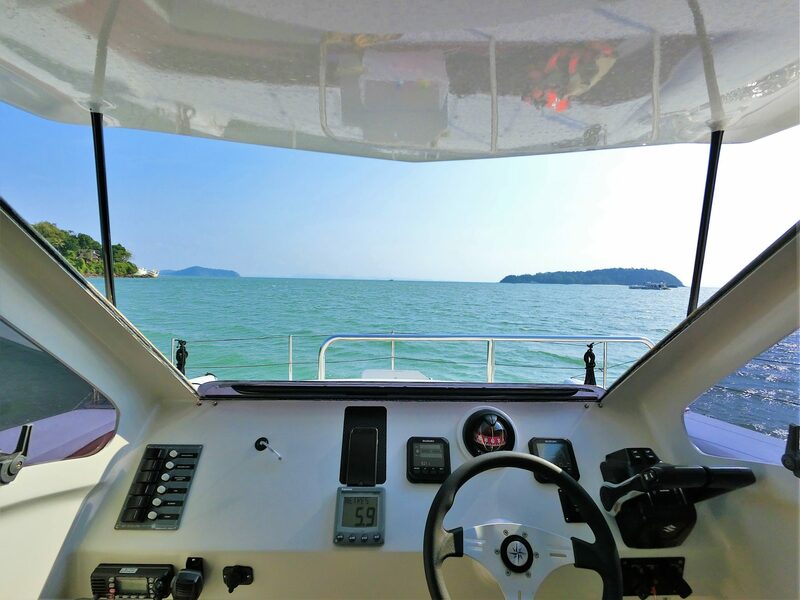 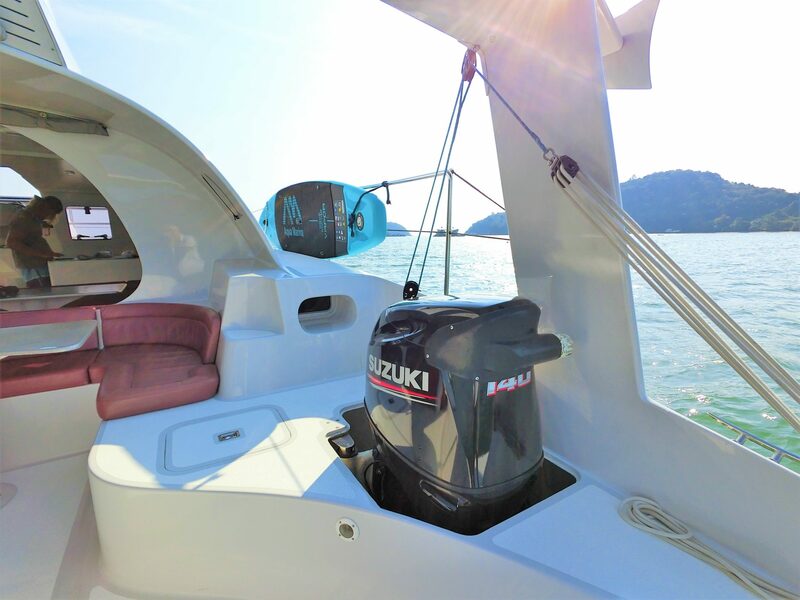 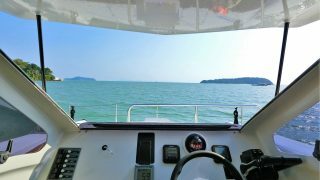 Sporting a central helm the Captain can see all parts of the boat which enhances safety and manoeuvrability. 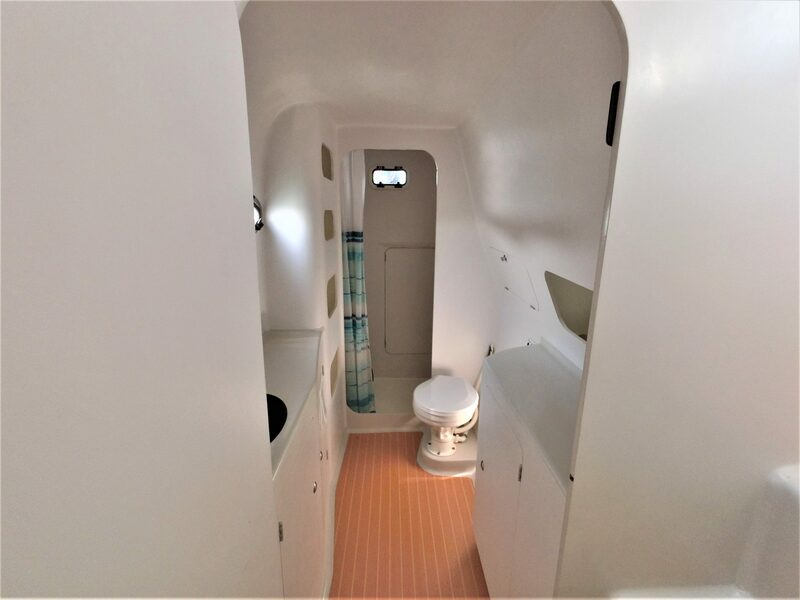 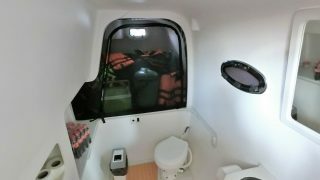 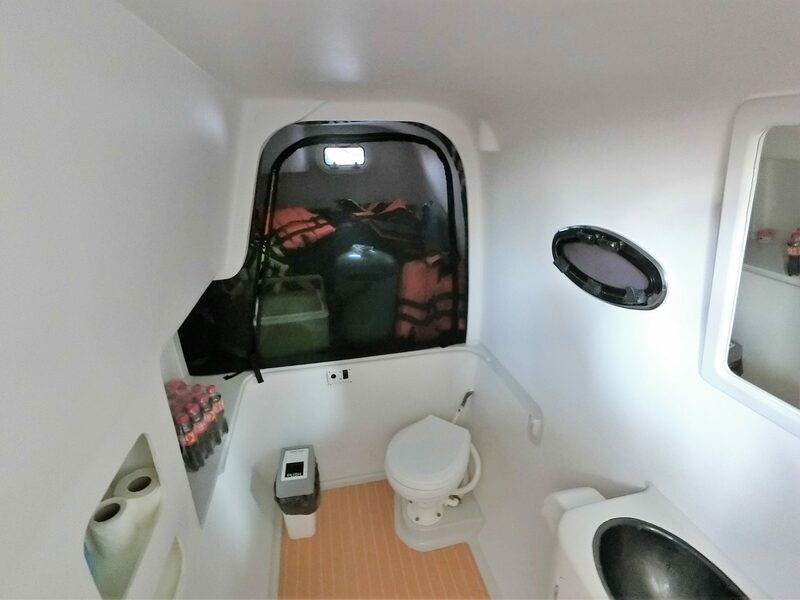 Further in the hulls there are two huge bathrooms for guests and forward a double cabin suitable for crew/owner operator. 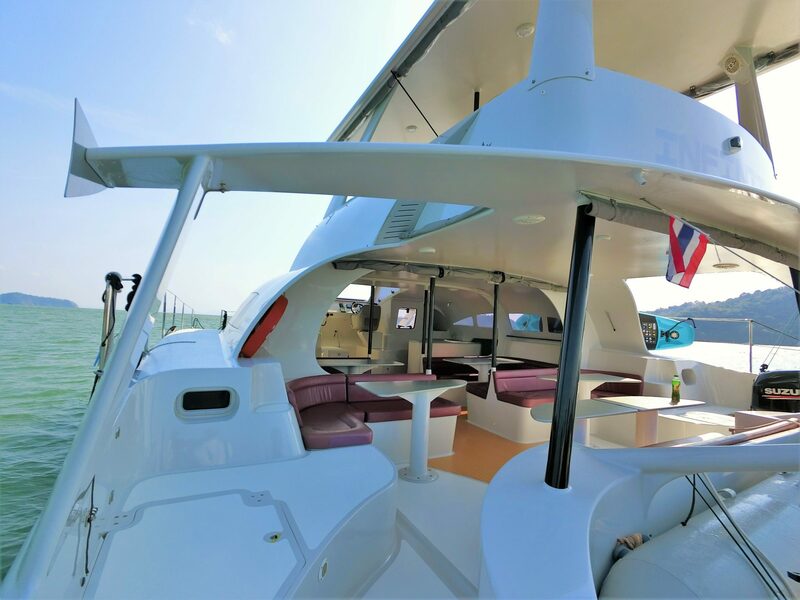 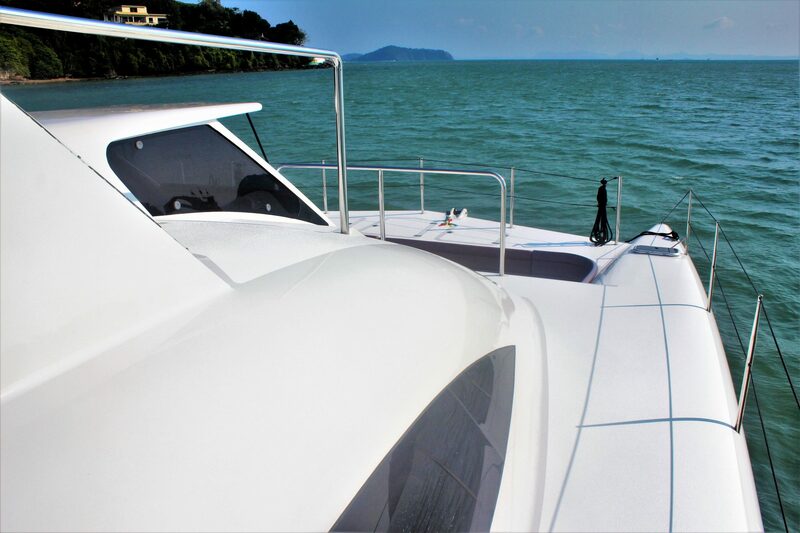 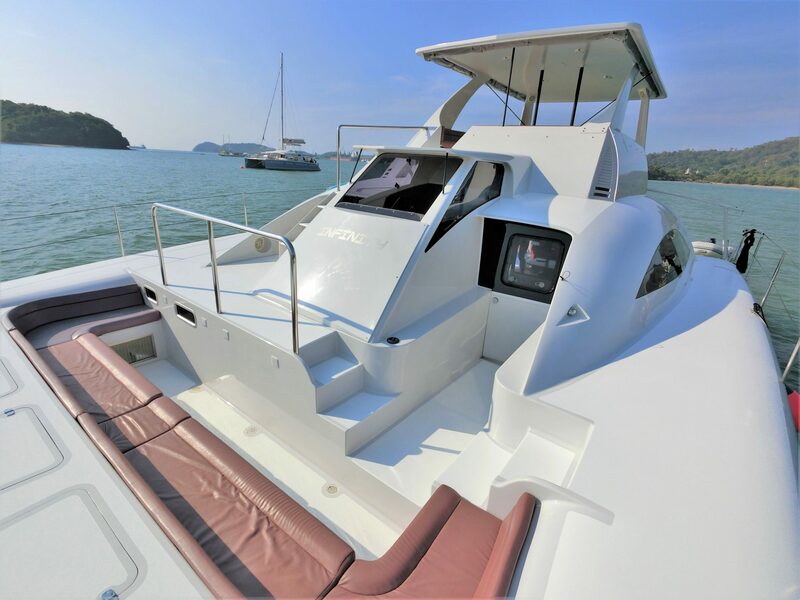 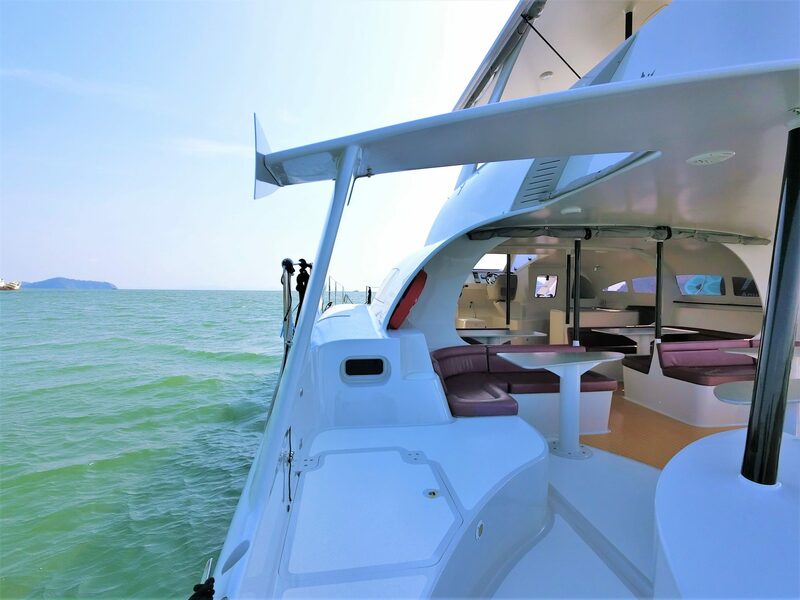 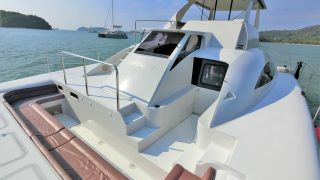 Currently in build in Phuket she is readily accessible for Thailand/ Maldives/Seychelles or further afield. 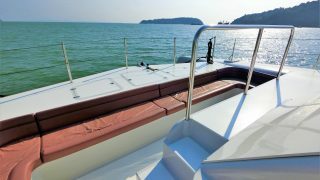 Delivery can be arranged worldwide for the new owner. 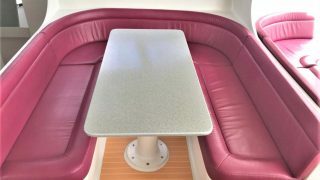 Beam Overall6.55 m / 21' 5"
Centreline Beam5.25 m / 17' 22"